Following on from 2008’s Our Beloved Month of August, Portuguese director Miguel Gomes returned victoriously last year with monochrome marvel and Berlin Film Festival hit Tabu (2012), an engaging, provocative and poetic drama set both in Portugal and in an unnamed African location. 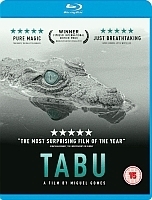 To celebrate Tabu’s home entertainment release on 14 January, we’ve kindly been provided with THREE Blu-ray copies of the film to give away to our loyal readers, courtesy of our good friends at New Wave Films. This is an exclusive competition for our Facebook and Twitter fans, so if you haven’t already, ‘Like’ us at facebook.com/CineVueUK or follow us @CineVue before answering the question below. Bearing the same title as F. W. Murnau’s classic Tabu (1931), shot in black and white and taking place at least partly in a distant land, Gomes’ third feature film is divided in two distinctive yet complementary storylines. Whilst the first part, shot in 35mm and in the present time, portrays a society wallowing in nostalgia, the second part, shot in 16mm, goes back in time and plays with history, sound, the concept of linear narration, as well as the ideas of melodrama, slapstick, passion and tragedy. Both parts feature Aurora at two different stages of her life: an older Aurora regrets a past long gone while a younger Aurora dreams of a more passionate life. A virtuoso film, Tabu also offers a reflection on Europe’s colonial past. At which major European film festival did Miguel Gomes pick up the Alfred Bauer Prize back in 2012? Miguel Gomes’ Tabu is released on Blu-ray and DVD from 14 January, courtesy of New Wave Films. The competition closes at 6pm on Thursday 17 January, 2013.